We discussed our needs and set up an appointment. They are very professional and made sure to understand exactly what we wanted. The made several suggestions which improved our home theatre a lot. They helped us choose the best products for our budget, designed our theater, reviewed the project again before the start date. There crew of 4 completed our theater in a day. They cleaned up after themselves and trained us on our new system. they even called about a week later to make sure we did not have questions and answered the few we had. Complete Automated Technology did an outstanding job of installing my home theater and I had them come back to automate my house. My Electric bill has already noticeably dropped too! I am making plans to have this firm install automated blinds. They are professional, through, clean up after they complete the job, and make sure that we can operate our new systems. I have referred to family and coworkers. Great job! James professionally performed what was a tough install in my 3.200 sq. foot home, running over 500 feet of quality cable to the Center, Front, Surround and rear surround speakers as well as 2 powered sub-woofers through a tiny crawl space. Not a thing was left out of place or dusty. James and his team personally came back to ensure proper operation a few days later. I will be hiring Complete Automated Technology for future wiring/home-automation needs (wants). I couldn’t be happier. We’d been considering mounting our TV for almost a year. After reviewing and getting quotes from several companies, we decided to hire CAT for the job. We originally spoke with James in December of 2015. He came to the house, looked at the space and gave us some great recommendations. Then, things happened here and we had put the project on hold until a couple of weeks ago. When we were ready, James responded quickly and I was pleased that he was willing to honor his original quote. He and one of his technicians (Carlos – sharp guy) came to the house, on time, worked quickly and adapted the mount I’d purchased off Amazon to work with my television. I’d suggest you talk to James about his mounts instead of purchasing one blindly. Anyway, they did a great job and the television looks fantastic. I strongly recommend CAT for your home electronic projects and we will definitely use them again. Very impressed with this business. The people are knowledgeable and honest. I was very happy with the 2-man crew that did the work. Very professional. Would highly recommend Complete Automated Technology. Extremely courteous and professional. Worked quickly and cleaned up well after the job was completed. Cannot recommend enough. James called me at 8:30am on a Sunday morning, literally just 10 minutes after submitting my needs through home advisor. Also followed up 2 days after the install to make sure everything went well. superior customer service. James and Carlos were the best! They installed a lot of new equipment and software for me. They made sure everything was as I wanted it to be before they left. James called me a few days later to make sure I was happy with their work. I have already recommended this company to my friends. They will be my go-to company for my computer technology needs in the future. The men that showed up were professional and very thorough. I had about 14 cables coming out of my wall and they were able to identify them all and made sure my antenna was working before they left. They were able to answer all the questions I had and gave me a lot of extra I needed regarding amplifiers, installation etc. Carlos and James are very well manner, knowledgeable and professional. They mounted my T.V. on the wall and put a new outlet in the wall for my T.V.. They even helped me to put up a blind in my kitchen. They are very good guys. They even cleaned up after the work. I am very Happy with the work. Audio/Visual & Computers needs to keep these two guys. I will tell all my friends about them. The price was a little expensive $65. per person per hour. They did do a GREAT JOB!!!!! There again I was quoted a much higher price from a handyman. So maybe this is a fair price… I will use them again!!!! Complete Automated Technology, LLC is a local independently owned full service audio, video, lighting design, and smart home integration company. We provide a single source solution for all of your home or office technology-integration needs. Call us to check on rotating specials and bonuses all throughout the year, and especially during the holidays! Here at Complete Automated Technology, It is our passion to deliver precision, quality, and satisfaction at every turn, striving to bring the best products and services to our customers and industry in every installation. Complete Automated Technology and Tiohome automated light control systems make a dramatic enhancement to your lifestyle, improve comfort, add convenience and save energy. With lighting, HVAC, appliances, and shade control systems, you can control your home from the convenience of wireless remote, keypad, or from any device with access to the internet. Make your building work harder for you by adding intelligent, energy-efficient building control. Tiohome provides flexible, scalable systems that can fully integrate lighting, shading, and other sensors for maximum energy savings. A building designed for maximum efficiency using our technology can add up to 46 points to becoming a LEED certified building. The ability to control your window treatments with a smart phone, or have them automatically open or close based on timers, astronomical timing, or pre-programmed conditions is not only a cool home feature, but it saves time and energy. Here at CAT we have a wealth of knowledge and experience installing everything from television mounts to complete home automation systems. With our expertise and diverse skills we can take on any technology project for your home. We look forward to working with you to bring your house into the 21st century. Hover over our services section to read all about the upgrade services we provide. A Full Service Smart Home and Commercial Automation Company! Home automation enables remote and automatic control over a variety of devices in and around your house. 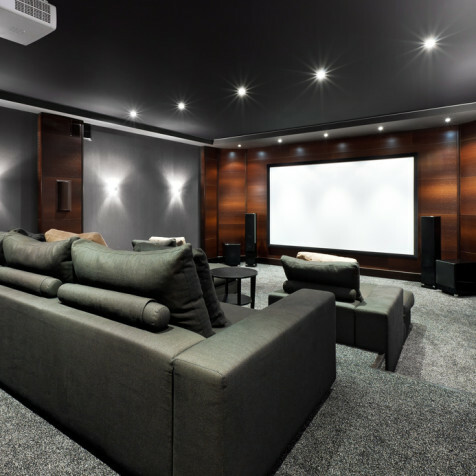 At its most sophisticated and powerful, home automation will control for your entire home, including A/V entertainment, lighting, automated window treatment, climate control, security, surveillance, and communications. Automation can make your home work for you, all from the convenience of a familiar, easy-to-use interface of your remote control, smartphone, tablet, computer and other connected devices. You can connect to your home from anywhere in the world using your home internet connection. Until recently, home automation was too complex and costly for most homeowners. However, with enormous advances in technology and greater consumer demand for energy efficiency, digital entertainment, and security; creating a smart home has become increasingly mainstream and affordable. If you have a beautiful apartment or an expansive house, there is no excuse for not making it smart, energy efficient and easy to enjoy! With light controls, you can save energy AND improve your working environment and quality of life at home. We gathered a list of 10 eco-friendly facts about light management solutions that are often overlooked. The possibilities may surprise you. Shading systems save energy by harvesting daylight and reducing the load on HVAC systems, making any project more eco-friendly. Shading can also be made from eco-friendly materials, which further promotes sustainability and reducing the impact on our environment. Every dimmer automatically saves 4-9% in electricity—even at the highest lighting levels—over a standard on-off switch. When users choose to dim their lights, even more electricity is saved. Quite simply, the more you dim, the more you save. A standard light switch only saves electricity in the “off” position. Tiohome dimmers and controls save energy 24-7.